Outdoors 720: Whale Wars: Did Japan earthquake, tsunami bring an end to illegal whaling? Whale Wars: Did Japan earthquake, tsunami bring an end to illegal whaling? Are the whale wars over? The man who made them popular seems to think so. Captain Paul Watson of the Sea Shepherd Conservation Society -- and star of the popular reality TV show “Whale Wars” on Animal Planet -- believes Japan’s 9.0-magnitude earthquake and resulting tsunami brought about a big change in Japanese whaling. Each winter, during Japan’s whaling season in the Southern Ocean Whale Sanctuary off the coast of Antarctica, vessels from Sea Shepherd wage a war against Japanese whalers, who kill hundreds of whales in the name of research. Sea Shepherd contends it’s an illegal commercial whaling operation and does everything it can to disrupt the whaling fleet, including throwing stink bombs of butyric acid onto the Japanese vessels, along with ramming, boarding and disabling them. In mid-February, the whaling fleet headed home early, thwarted by Sea Shepherd’s efforts in what was its seventh anti-whaling campaign. Watson estimates that the whaling fleet did not even take 10 percent of its quota, the Sea Shepherd saving more than 900 whales this season. Even before the disaster in Japan, Watson said he was 75 percent certain the whaling fleet would not return to the Southern Ocean next winter because it knows Sea Shepherd can stop its efforts, it is deeply in debt to the Japanese government, and whaling is becoming more and more of an embarrassment to the government of Japan. Of course, there is another possibility that Japan may once again see whale meat as a cheap food for a nation in crisis just as the whaling fleet was organized in 1946 by American Army General Douglas MacArthur to provide cheap protein for post-war civilian populations. Such a move would be blatantly commercial and thus illegal. Japan may appeal to world sympathy for justification, but most likely, they won’t get it. We will be watching the Japanese whaling fleet closely. 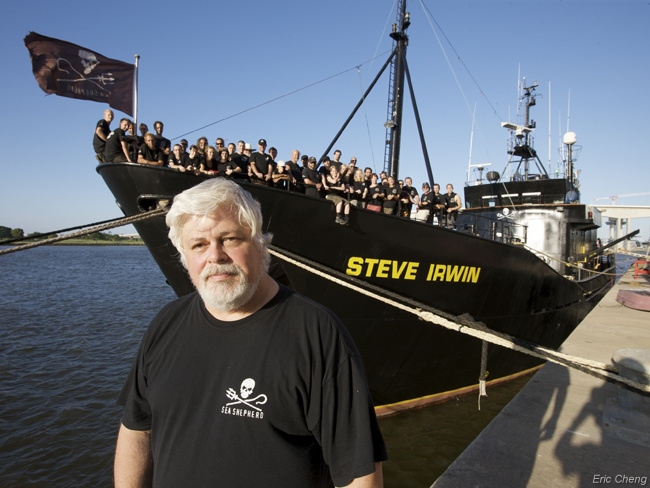 If it looks like they intend to return, then Sea Shepherd will also return. Knowing Watson, you can count on it. Thank you so mach Admiral Paul Watson for stopping them if I had the time and money I would go and help you in a hart beat. I would do all I can to help you and Sea Shepherd. To answer your question yes I would put my life on the line for a whale’s life in a hart beet. Mother Earth is angry about a lot of what humans are doing it, to us, we have to re think our actions of cause and effect. Whales are Gods creatures and it seems he has had enough of a needless killing of such a beautiful and magnificent and smart animal. I just hope the ships land locked and miles from the sea are the whalers. Truly whales are a miracle of all Gods creations and should be treated as such. As a diver and fisherman who has been to sea many times and had a few chance encounters with whales and many other sea creatures even if for a brief moment you get to see one of Gods greatest creations and thank him for showing you his magnificence of creation. God Bless the Sea Shepherd ! This is long overdue and for such a terrible thing as the Earthquake to happen for the Japanese to stop this terrible and senseless killing is sad. However it is wonderful that it has. Now, our childrens children have a chance of seeing these wonderful creatures in real life, rather than on screen. Thank you Paul Watson and Sea Shepard! God Bless Paul Watson and the Sea Shepard crew for what they do. He didn't stop anything, unless of course you include when his "fleet" disabled a legal ship in international waters. He picks on the Japanese because he knows they won't send warships to defend their flag carrying commercial ships. Any other major nation would have send him to the bottom by now. Hopefully one will in time, with him and his crew aboard. He has earned a sea burial to be sure. What Paul and his crew are doing is amazing. That is crazy to say that you wish they would die about people who put their lives on the line to save gods creatures. I love the show but the best way to know if the whalers are doing something illegal is to get someone from the ships to talk to the members of Sea Shepherd.